Yesterday, possibly for the first time without a mechanical (although someone will, I am sure, remind me when I’ve been a wimp before), I abandoned a ride because I just was not enjoying myself. The weather forecast for Friday had looked very poor for several days. My wife Sue had repeatedly asked me if I was sure I wanted to go. But the plan – to cycle to the CTC East Midlands Camping Rally at Beaumanor Hall in Leicestershire – had been some time in the making. And the camping fees had been paid. Three riders gathered in Chapel Brampton and had cups of tea and a tour of John’s huge garden so that I could see his fence laying from the garden side. 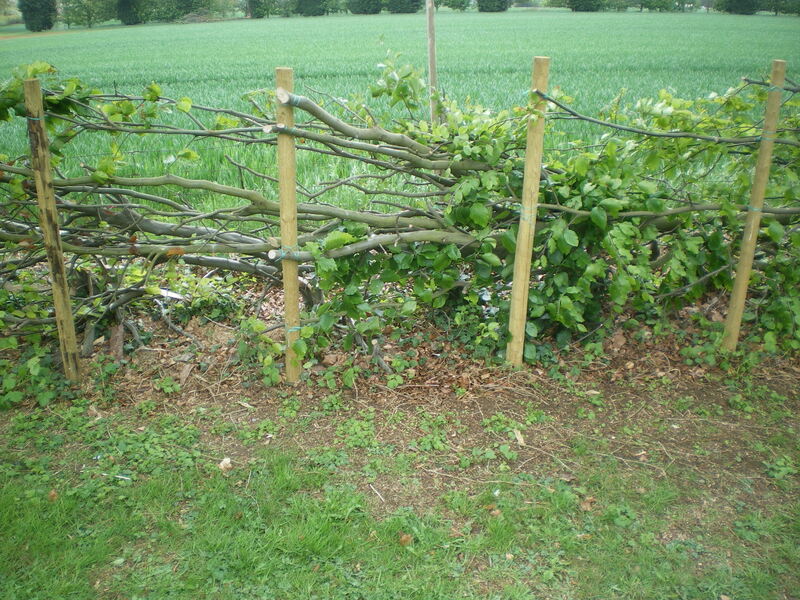 I’ve written about John’s fence-laying before: here and here. 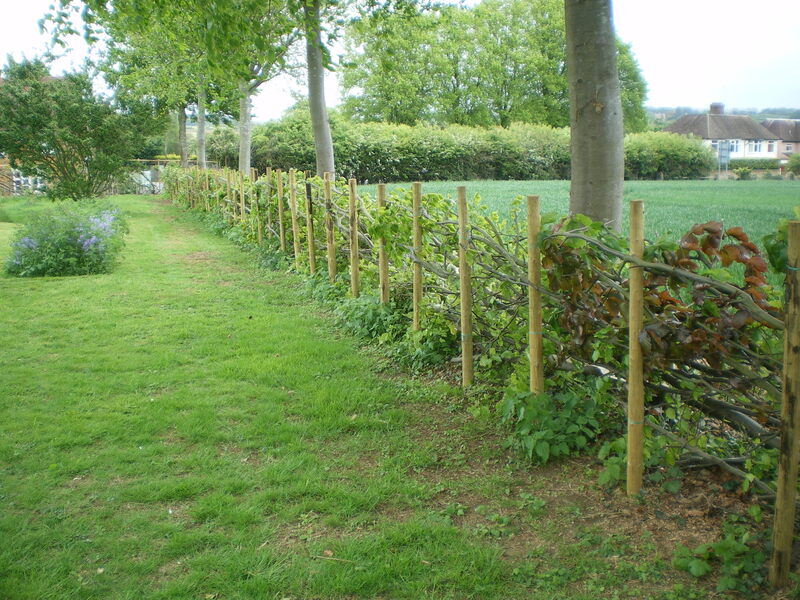 His work is clear and visible from the road side immediately opposite The Spencer Arms but I enjoyed seeing his craftsmanship from inside, so to speak, and then realised that he had laid a longer fence at right angles where his garden adjoins the neighbouring field. This meant, of course, that we waited until it was actually raining before we started to cycle! And so wet was it that, even from the start, I donned winter off-road waterproof overshoes! There had been talk of pedalling just as far as Market Harborough (via a leisurely lunch at the Waterloo Farm Café), catching a train to Loughborough, and then pedalling south – with the wind at our backs – for the three miles or so to Beaumanor. But John in the end packed his trailer and we thought this ruled out a train journey. I’d describe the weather as stormy squalls, rather like a storm at sea, in that there were periods of lashing rain and then periods when it was just damp. Then the lashing rain again. The two constants were the very strong winds (swirling about so that occasionally there was protection from the hedges – how ironic! – but usually headwinds) and the dark grey or black clouds which filled the sky. There were perhaps three minutes of sunshine during the morning. You’ll know that sudden realisation that you have when ALL the clothes you are wearing are damp. This time the realisation hit me when we reaching Sibbertoft. When we reached Theddingworth I saw a road sign that indicated Market Harborough was just four miles to the east. I was beyond dreaming of trains by this point. I was dreaming of the coffee shops there and of phoning Sue and getting her to pick me up in the car! I was having nightmares about pitching a tent in a sodden field and of never getting my clothes dry for the next day. At the crossroads in Theddingworth, I carefully explained my lack of enjoyment to John and David. They attempted to use arguments: (a) that it would be terrible to admit my wife was right, (b) that the worst of the weather was behind us (yeah, right! ), (c) that it was building my character. It may have been at this point that argument (d) was put forward: that we could sleep in the drying room at Beaumanor! To end this surrealism, I agreed to pedal on to our planned lunch stop – The Old Greyhound at Great Glen – for a final decision there. The next village, Mowsley, appeared through the rain and wind to have closed and then – like St Paul on his way to Damascus – The Queen’s Head appeared (bright, clean, dry and welcoming) at Saddington. My companions agreed to stop for lunch! No arguments were holding me back now. The phone was in my hand, Sue readily agreed to pick me up, and I abandoned. We had pedalled into the wind and rain for two-and-a-half hours and covered just nineteen miles. (The route is here.) It was 1.15 p.m. The pub’s coffee was hot, the fish and chips excellent, and the sticky toffee pudding comforting. Sue arrived and more coffees followed. My companions, although maintaining their plans, showed no signs of hurrying back into the storm. The other customers left and the four of us had the warm dry pub to ourselves. John remembered that it was his birthday! This seemed the perfect excuse to drink more beer. 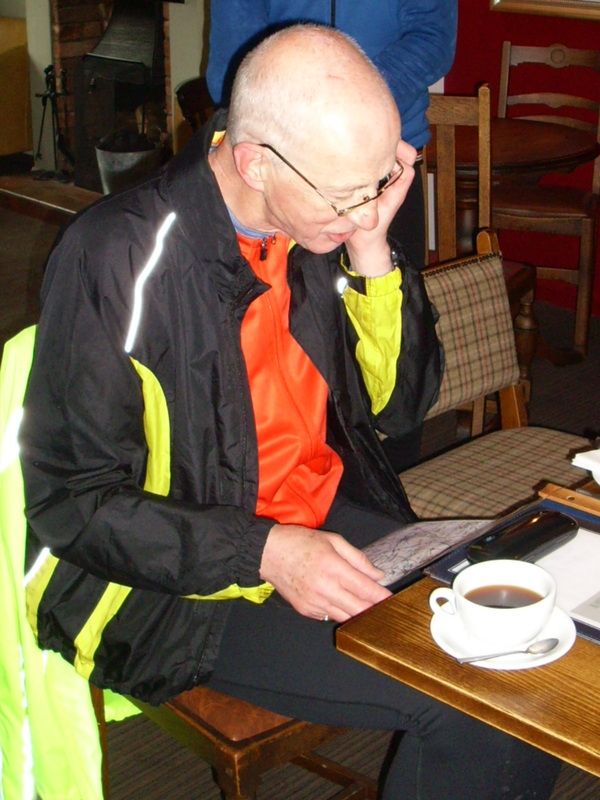 Eventually, John and David calculated that they might reach Beaumanor by 7.00 p.m. if they started pedalling again. They put on the layers they had taken off on entering the pub; they were just as wet as they had been. Today – Saturday – John and David will probably be enjoying a ride in the dry. But the forecast is not great and I would expect more downpours before they return on Tuesday. Ah well, we live and learn!